It can be disappointing when you travel somewhere for the first time and realize that all the photos you had seen of the place were very carefully chosen and composed. Yes, there is a beach in front of this hotel. A beach that is exactly the width of the two people shown sunbathing on it in the brochure. Yes this fantastic view of the sunrise was taken from our hotel balcony, clearly by some sort of contortionist that can lean out past these enormous rain gutters. Today’s Maximumble will always remember. 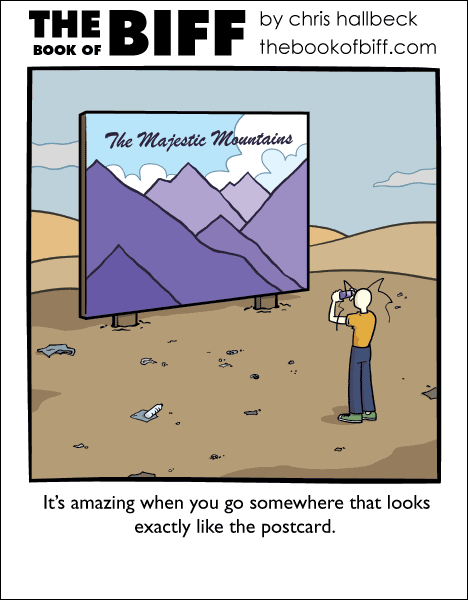 I’d pay good money to go to the hotspot that sports the photo Biff snapped of that artboard featuring that landscape. i went to ankor wat about 6 years ago. i expected to be able to wonder around this big, mostly empty ruin. instead it was packed cheek to jowl with mostly japanese tourists, had concrete staircases built on to any of the stone ones that were even moderately worn down, and there was talk of putting in escalators. Mmm…. looks like what our earth will be in oh… maybe 40-50 years? @J: Chichen Itza is just as bad. Not only is it filled with tourists, but souvenir vendors as well. Most sit along the walkways, but the more aggressive ones walk around and approach you.